This two-day symposium aims to bring together scholars and researchers working with computational approaches to texts. The event targets a broad audience interested in the application of digital text analysis technology, as text mining, topic modeling, authorship detection, writing style analysis, text reuse, or more generally tasks performed through Natural Language Processing (NLP). These techniques have significant potential not only for the study of literature but also for the study of texts and language in general. The symposium aims to create an open forum for showcasing these techniques. The event is also grounded in the idea that computational text analysis should be integrated not only in the academic research by faculty and their PhD students, but also in a pedagogical environment. The use of computational analysis opens up new questions in literary studies, and exposes students to many different ways of thinking about literature today. Computer-aided literary studies still thus tend to be focused on literatures written in modern languages. NLP tools are quite developed for modern languages, especially for the modern English language. For medieval and premodern languages, due to their instability of orthographic forms, attempts to conduct computer-aided (thus, to a degree, systematic) research face many challenges to normalize and standardize their linguistic forms. Therefore, the symposium also aims to explore the use and challenge of using NLP tools for studying literatures written in underrepresented and historical languages, such as the medieval and premodern variants and precursors of Spanish, French, Latin, and Dutch. Therefore, a special focus will be on the preprocessing routines available for these texts, such as lemmatization, by which we collect inflected forms under a single item or lemma, as well as challenges faced normalizing orthographic variation of historical texts and other languages with unstable orthographies. Among the international and national speakers we will have several experts on the topic. Our envisioned program for the symposium is as follows: On the first day, there will be several workshops, including one devoted to integrating computer-assisted analysis in the classroom, which will offer an introduction to stylometry, visualization, and text-reuse. On the second day, there will be talks (30 min) that present ongoing research projects, methodologies, and challenges. The subject languages are preferably, but not limited to underrepresented and historical languages. We especially welcome contributions from those working with any type of textual corpora, preferably those conceived for a specific research and/ from a diachronic perspective. We conceive this symposium as an opportunity to share (best)-practices and broaden conversation, thus proposals can be on ongoing and experimental methodologies. We invite researchers to submit 500-word proposals (including footnotes but excluding the bibliography) in one single page related to any of the topics mentioned above. The format of the contributions will be 20 mins presentations followed by 10 min Q&A. Title, name(s) and affiliation should appear and the preferred formats are .txt, .docx, .odt and pdf. Submissions must be sent to susanna_alles@miami.edu and they will be reviewed by the scientific committee. The official language of the symposium is English, but it is possible to submit a proposal also in Spanish, French, or Italian. LOCATION: University of Udine, Udine, Italy. The main topic of the AIUCD 2019 Conference is ‘Pedagogy, teaching, and research in the age of Digital Humanities’. The conference aims at reflecting on the new possibilities that the digital yields for pedagogy, teaching, and scholarly research: how will these transform teaching in the humanities? What contributions can humanistic cultural critique offer to the digital revolution? What is the connection with the digitization plan for Universities outlined by the Ministry? It also concerns the Digital Humanities as a new discipline, and this brings forward further considerations: how can the new professional figure of the digital humanist be developed? Which areas of knowledge define the Digital Humanities as a subject of study, research, and teaching? How can we recognise, classify, describe, and evaluate research efforts in the Digital Humanities? 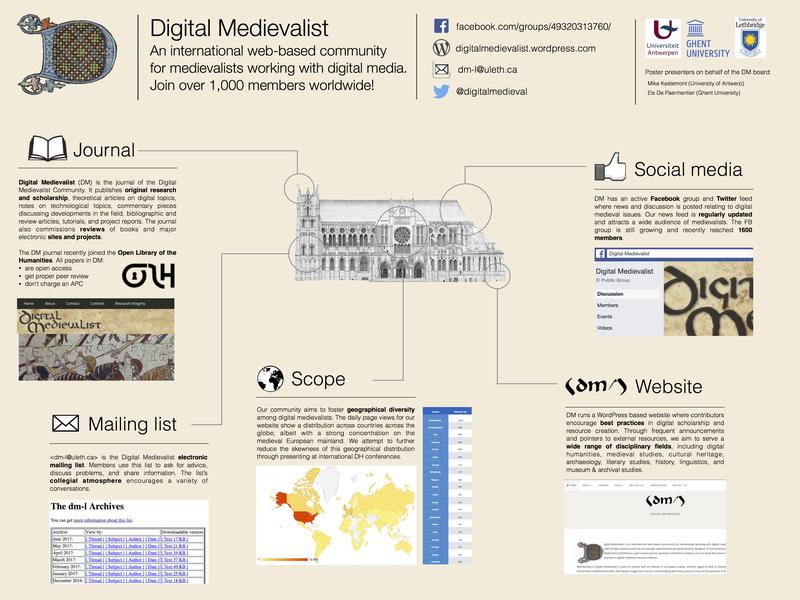 the role of inter(multi-trans-cross)-disciplinary DH research in European projects, enquiry, and teaching. teaching DH: which models, technologies, and methods? teaching DH at the University: how is it taught today? Big Data methodologies and technologies in DH research and teaching. digitization methodologies and technologies for the production, preservation, and promotion of digital cultural heritage. The deadline for submitting proposals is the 25th October 2018 (h. 23.59 CET). Notifications of acceptance will be sent to the authors by 15th December 2018. The official languages of the AIUCD 2019 Conference are Italian and English, but it is possible to submit a proposal also in the following languages: French, German and Spanish. In these cases, it is mandatory to provide a short abstract in English in ConfTool. workshop and tutorial: in the two days prior to the Conference, one or two workshops or tutorials on topics or tools of interest to the DH community will be accepted. Relevance to the topic of the conference; consistency with the Digital Humanities and Digital Culture domains. Originality, relevance, or innovative approach. Methodological rigour, accurate description of the methodology; the research presented should be reproducible. Adequacy of the theoretical and conceptual approach to the reference domain. Consistency of arguments; clear definition of the objectives; coherence between objectives and results. Critical analysis of the literature; a bibliography. Quality of any technical solutions proposed within the reference domain. Good balance between the Humanities and Computer Science components of the research. Structure of the text; quality of writing; ease of understanding; explanations of scientific language. To submit a proposal, please sign into ConfTool (http://www.conftool.net/aiucd2019). When submitting a proposal, authors must specify keywords from those suggested by the platform in order to facilitate the review process. Workshop or tutorial proposals should be at least 1000 words and include: a title and a short description of the content and its relevance to the conference and the DH community in general, complete information of all tutors with a brief description of their research interests and previous experience, requests for technical support at the conference, and whether the workshop will have its own Call for Participation. Posters should be written in Italian or English. Posters will also need to clearly present the objectives of the project, provide a brief overview of the state of the art and the methodologies adopted and, where appropriate, the results obtained or expected. They must also contain a short bibliography. The format is portrait A1 (841×594 mm). Posters will be displayed in a dedicated space at the Conference venue. Display panels will be provided. Please bring your poster already printed, as we are unable to provide a printing service. Personal laptop computers may be used in the poster exhibition area. If your presentation includes a laptop, please inform the organising committee on acceptance of your proposal. Specific poster slam sessions will be scheduled in the Conference programme to give authors the opportunity to briefly introduce (max 2 minutes) their poster. which also includes editorial specifications. Valid formats are DOCX, DOC, and ODT. 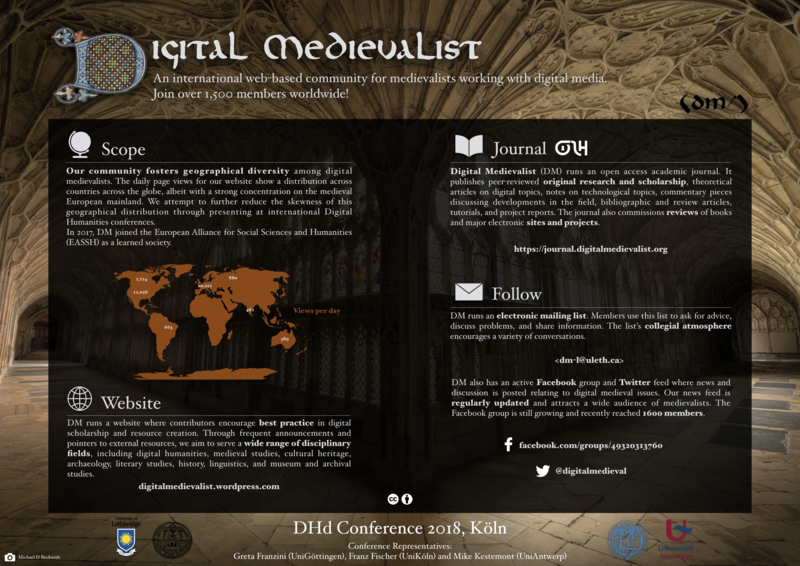 The Textual Heritage community and Vienna University are pleased to invite submissions of abstracts for the El’Manuscript-2018 international conference on the creation and development of information systems for storage, description, processing, analysis, and publication of medieval and early modern handwritten and printed texts and documentary records. Any person involved in the creation or application of these resources—including researchers; instructors; staff of libraries, museums, and archives; programmers, and undergraduate and graduate students—is welcome to participate. El’Manuscript-2018 is the seventh in a series of biennial international conferences entitled “Textual Heritage and Information Technologies” that brings together linguists, specialists in historical source criticism, IT specialists, and others involved in studying and publishing our textual heritage. Along with the lectures, a summer school will be part of the conference, which will allow practitioners to become familiar with various systems and methods for working with manuscripts and texts. The working language of the 2018 conference is English. In the philological sections talks in Russian are welcome, but should be accompanied by Powerpoint slides in English. Papers presented at the conference will be published in a volume of proceedings and on the textualheritage.org website. Deadline for abstracts: 28 February 2018. Reviewing: The abstracts submitted to the conference will be peer-reviewed. The Programme Committee will reject papers not meeting the conference themes or quality requirements. The reviewers’ comments will be transmitted to the authors. Notifications of acceptance by the Program Committee will be sent by email before 15 March 2018. The accepted abstracts will be published before the conference. Registration opens 15 May and ends 31 August 2018. 1. NUME, Research Group on the Latin Middle Ages, organizes the IV Cycle of Medieval Studies, June 2018. 2.2 Contributions will be structured in specific panels. 3. The conference will be held from 3rd to 7th June 2018 at the Auditorium Ente Cassa di Risparmio di Firenze, via Folco Portinari, 5 (Florence, Italy). 5. Proposals will be evaluated by the Review Board on the basis of quality, interest and originality. The judgment of the Commission will be unquestionable. 6. The Commission will notify the convocation for the speakers considered suitable by February 1, 2018. 7. The selected speakers will be asked to prepare an oral intervention, accompanied by any images or videos, not exceeding 15 minutes (+5’ discussion time). Contextually, they will be asked to send a paper of their contribution for the Conference Proceedings by April 1, 2018. 8. Speakers will be required a participation fee of 100€, which, in addition to supporting the activities of the NUME Research Group, will entitle to 2 free copies of the Conference Proceedings. 9. The Conference program will be published by April 30, 2018. 10. The deadlines set out in this notice must be strictly observed, otherwise the contribution will be excluded from the call.